Roms Deals Readers: Thanks for reading the interview featured on Rom’s Deals about my recent 36 day Euro-trip that cost less than $1,700. Hopefully some of the info from our trip can provide some insight and inspiration for others to learn how to travel for almost nothing! 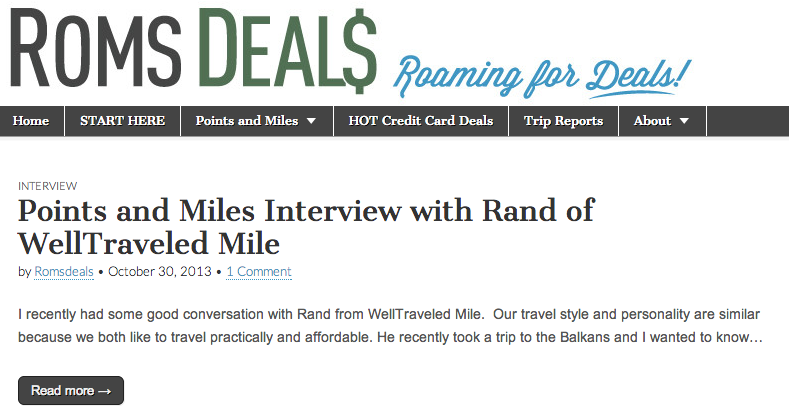 If you haven’t checked out the article yet, Rom interviewed me about my trip that took me through Turkey, Bosnia and Herzegovina, Croatia and Montenegro and that shows how I traveled affordably while staying in luxury hotels for free and flying in Business class paid for by points. Also be sure to check out the new infographic comparing saver economy awards across the popular US airline points programs. I’m finishing up the details on a more comprehensive post that will have charts for business and first class awards as well. Thanks Rom for the great interview and thanks for reading!